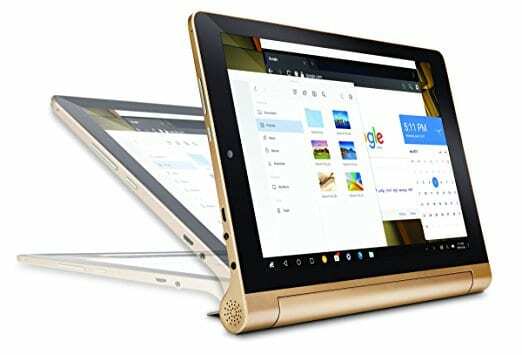 Following the success of the iBall Slide Brace X1 3G, iBall released the iBall Slide Brace X1 4G into the Indian market as a perfect upgrade to the iBall Slide Brace X1 3G tablet. From the Slide Brace X1 4G’s appearance, the striking semblance with its predecessor is hardly unnoticed. A unique upgrade is the 4G LTE with VoLTE connectivity support on the tablet. As we will be taking you through the specifications of this tablet, we will take a cursory look at the upgraded features. Let’s ride. Slide Brace X1 4G is almost entirely similar to iBall Slide Brace 3G. Its shape is no way different from the Slide Brace 3G. However, its micro-USB port and its audio jack were moved from the right-hand side position to the left-hand side. The dual chambered speaker remains at the junction between the display screen and the kickstand. The tablet comes in a beautiful Bronze Gold, another notable difference. The tablet has a large 10.1 inches display with Full HD display. The screen resolution is 1280 x 800 pixels for the clarity of texts, icons and images. Its screen display is the IPS capacitive touchscreen. It can be seen that there’s no difference whatsoever in this unit. This department of the tablet got a downgrade. Its rear camera has an 8MP shooter unlike the 13MP in the iBall Slide Brace 3G. Its camera comes with a LED flash for the brightening of images. The camera has features such as Panorama, face detection, face beauty and HDR. The rear camera has a 5MP shooter for the capture of selfies. The operating system of the tablet is the Remix OS. For the uninitiated, the Remix OS is a blend of Android OS with Windows OS. The Android OS is the Android 6.0 Marshmallow. The Remix OS gives the tablet’s app list display a Windows 10-like appearance, with the Android navigation buttons unusually on the left-hand side of the touch screen’s display rather than the centre. MediaTek MT8783 octa-core processor is what powers the tablet. The processor with eight cores is clocked at 1.3GHz. For the graphics production, the tablet was incorporated with the Mali-T720 GPU. The storage unit of the Slide Brace X1 4G is fixed at 16GB. 6GB of the storage is occupied by the OS while the 10GB is for the storage of files, documents and other stuff. The RAM of the tablet is pegged at 2GB. This handles the multitasking and smooth running of apps. The tablet’s powerhouse is a large 7,800mAh non-removable Li-Polymer battery. The tablet has 4G LTE with VoLTE connectivity. There is also the presence of a round pin DC, which allows the user to charge and at the same time make use of the available micro-USB port. There’s no earpiece in the device. Therefore the use of headphones or Bluetooth accessories can be used to receive calls. The price of the iBall Slide Brace X1 4G starts from Rs. 15,999 in India.